This is a special issue of The Voter that includes the information you need for the Annual Meeting: the 2019 – 2020 budget, the 2019 – 2020 slate of officers and the recommended updates to our positions and by-laws. Please review them before the Annual Meeting on May 2 at 6:15 PM at Glen Oak Country Club. In the meantime, we hope to see all of you at our Community Meeting on Water Literacy on April 18. We have heard great feedback about our speaker, Krista Grimm, the Illinois League’s water resources specialist and leader in the Lake Michigan League. The program at Village Links, 485 Winchell Way in Glen Ellyn, starts at 7:30 PM; doors open at 7 PM. 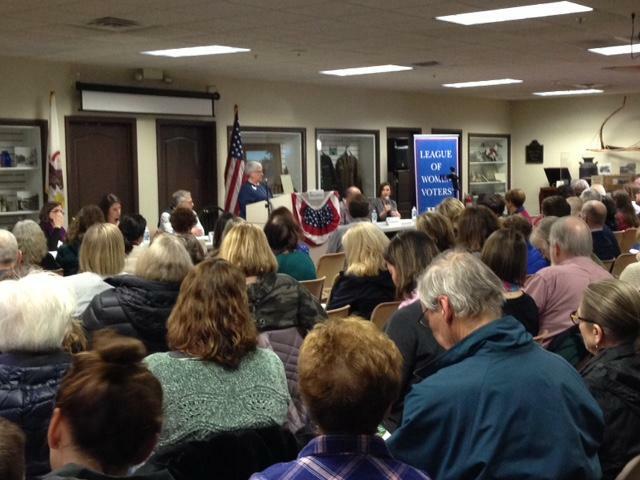 If you missed the candidate forum for the upcoming local election, you can find links to the videos on www.lwvge.org . Please make sure to vote on April 2 or visit the Glen Ellyn Library for early voting! 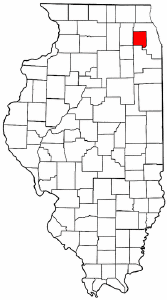 If you are interested in attending the LWV Illinois Convention in Champaign from June 7 – 9, let us know. We will need three delegates to represent Glen Ellyn. As we finish our term as co-presidents, we want to thank our wonderful board members and many volunteers who work tirelessly to inform and register voters. Together we make a difference in our community. 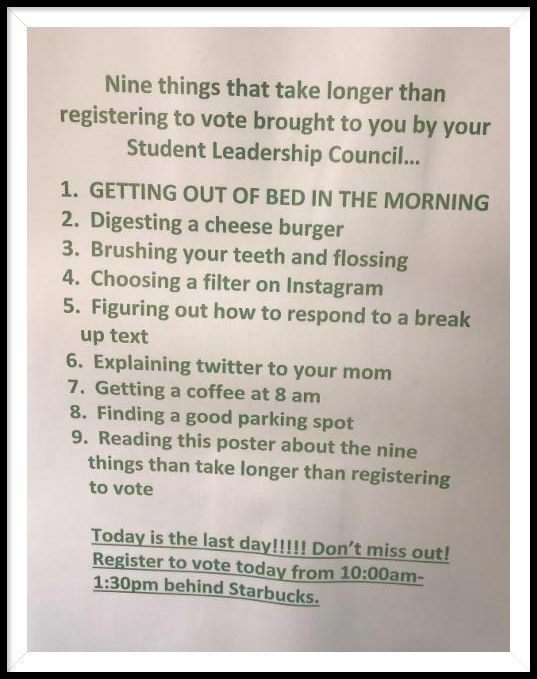 Voter Registration Day on March 5. LWVGE on the job registering new voters. Thank you members John Vitalis, Gail Bernstein, Rita Doyle & Barb Rebro. Building voter participation, awareness and democracy. · I want to get active! Your skills and time will be valued as we work to meet our mission. Please contact Julie Nolan at southie398@aol.com to explore a role on the LWVGE Board including VP of Program. Delve into the issues by screening possible topics for five Community Meetings during the program year. What issues would you like to gather more facts about? These meetings are open to the public in order to promote voter education and discussions on key political topics. Your organizational skills are utilized while you gain valuable knowledge about thought leaders in our political world. · Observer Corp Training 4/27 - Observing a local governing board meeting promotes our democracy. This short training is for members to learn why we observe, what we observe, and how we observe. · LWVIL School Quality Position - This is a state-level study regarding the LWVIL’s position on school quality. If you would like to gain facts on this issue, contact Michelle Thorsell at mzthorsell@gmail.com . · COD Environmental Fair 4/22 - Are you passionate about environmental issues? 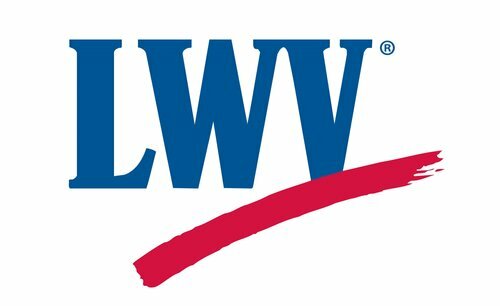 Sit at the LWVGE table at the fair and discuss issues with attendees. Contact Alix Darrow at alixdarrow@outlook.com for more information. Read details in the latest Member Information article above. Contact Jodi Baltimore at lwvgemembership@gmail.com with any new member questions. 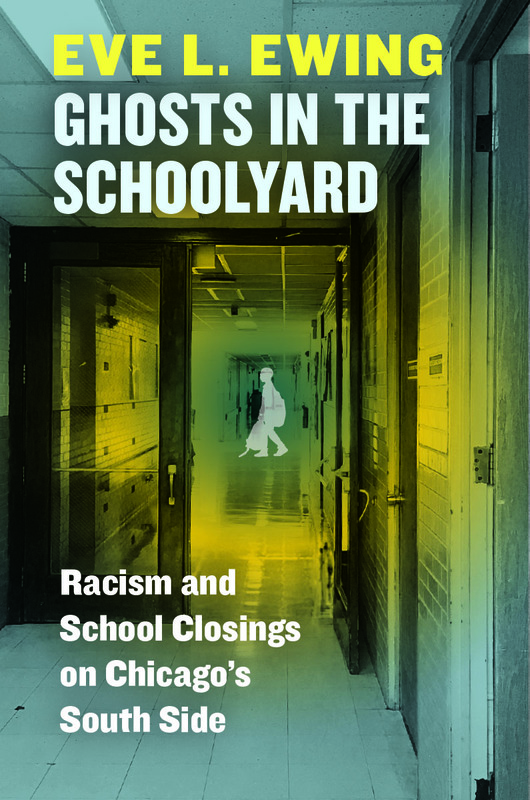 Our next book selection is Ghosts in the Schoolyard: Racism and School Closings on Chicago's South Side by Eve L. Ewing. Copies will be available one month before at the library, 2nd floor. The meeting will be May 18, 9 am at Michelle Peterson's home, 579 Riford Road. At the Annual Meeting on May 2, the Glen Ellyn League will be giving awards to League members who have worked exceptionally hard to make our League the best that it can be. · Susan B. Anthony Voter Service Award to a member who has worked diligently to register voters and inform voters on candidates and issues. · The Outstanding New League Member Service Award to a new member who has jumped right in and taken an active leadership role in our League. · The Phyllis Renfro Community Action Award to a member who has been exceptionally active in League and an activist in the community. Send your nominations with a short summary of why this person should receive the award to Lois Walter at loiswalter25@gmail.com no later than April 15. Candidates running in the April 2 local election met on March 16 for a candidate forum at the Glen Ellyn Historical Society History Center, 800 N. Main St. There, a large crowd of voters heard District 41, District 87, Glen Ellyn Park Board and College of DuPage Board candidates answer important questions put forward from the audience and from League members. Over 20 league volunteers stepped up to make this a successful forum where voters saw and heard directly from the candidates. Voters also had the opportunity to meet candidates in uncontested races for Library Board and Village Board. 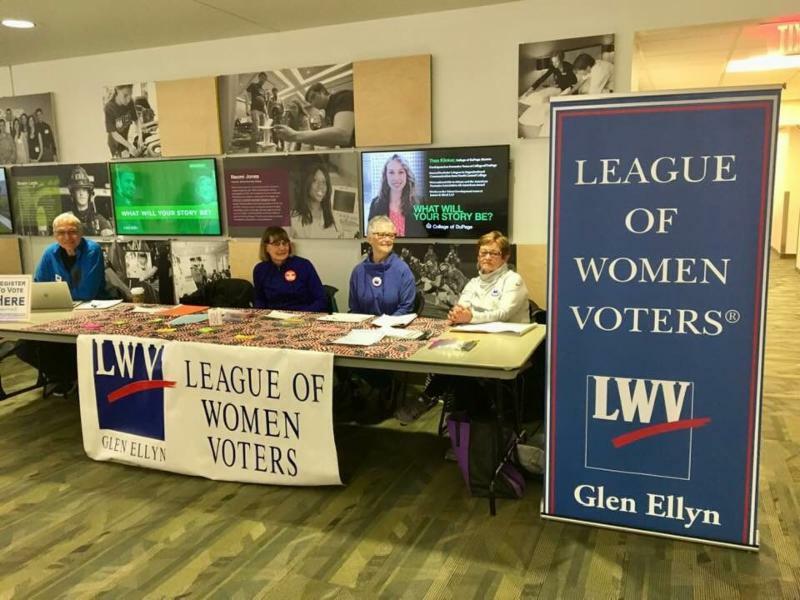 On March 4 and 5 League registrars met at College of DuPage and enthusiastically registered new voters and educated many others about online voter registration at ova.elections.il.gov and accessing a sample ballot through IllinoisVoterGuide.org . 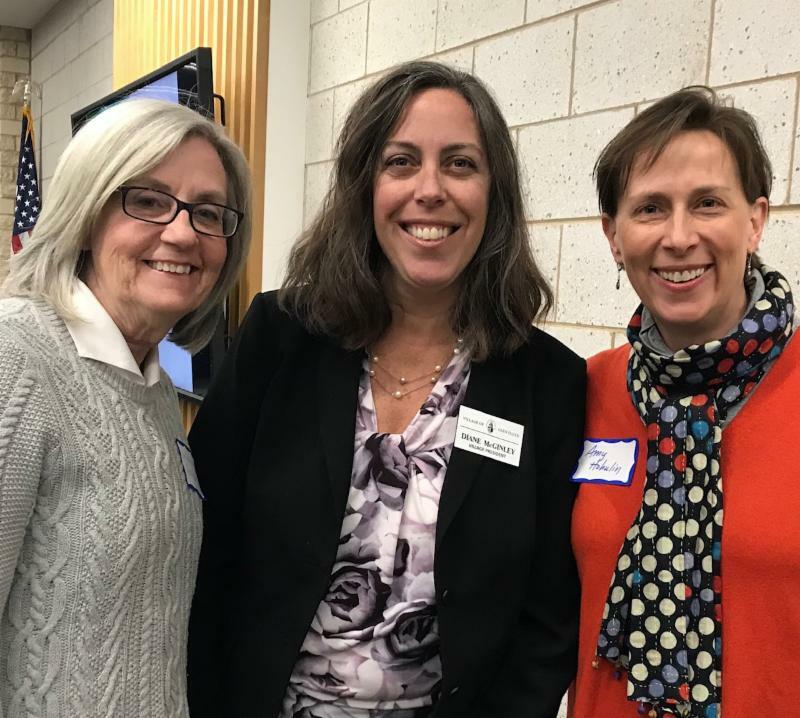 The State of the Village meeting on January 17 was held at the Glen Ellyn Police Department with our special guest speaker, Village President Diane McGinley, pictured here between LWVGE co-presidents Michelle Peterson and Amy Hohulin. The annual program planning meeting was conducted on February 2. The meeting was well attended on a cold winter morning. Seen here (L-R) are Michelle Peterson, Amy Hohulin, Erica Nelson, Michelle Thorsell, Margaret DeLaRosa and Candy Purdom. We hope you were at Cantigny for our shared event with area Leagues. A fine opportunity to meet our new Congressman, Sean Casten. The event, on February 21, was a sellout! 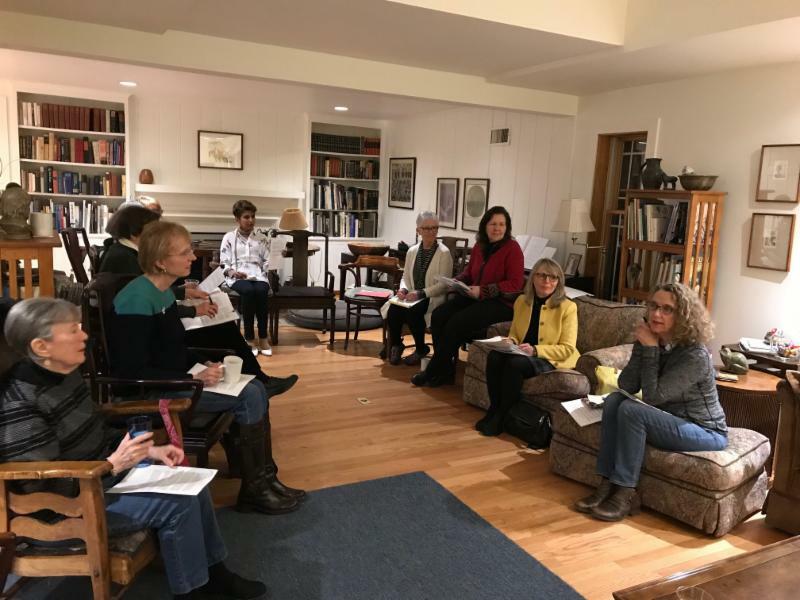 Our LWVGE consensus meeting to discuss revisions to positions was on February 28 at the home of Mary Sue Brown. 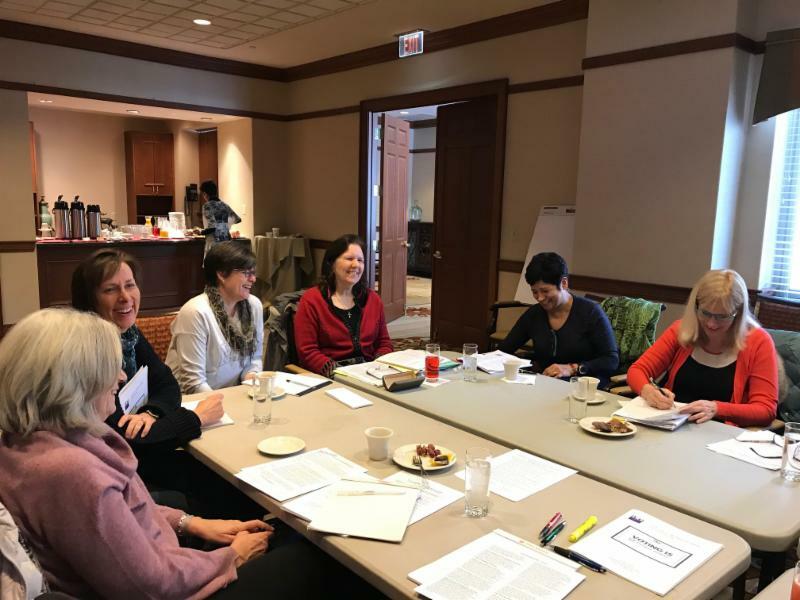 The LWVIL Issues Briefing took place this year on March 2 in Chicago. Members Kim Reed, Jayne Boeckelman, Lois Walter, Alix Darrow, Michelle Peterson and Amy Hohulin represented us there. 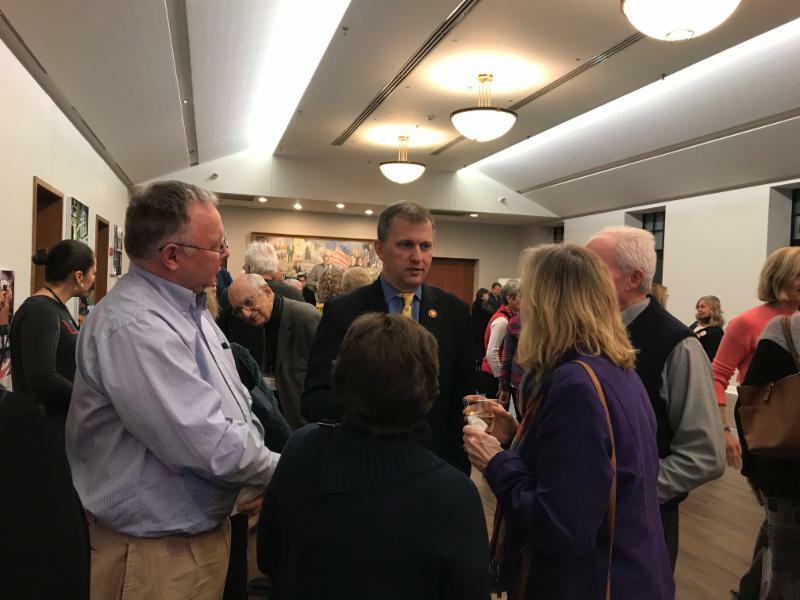 March 16 was the day of our successful Candidate Forums for local elections (Districts 41, 87, 89, COD and Park District) at the Glen Ellyn Historical Society. A full house. 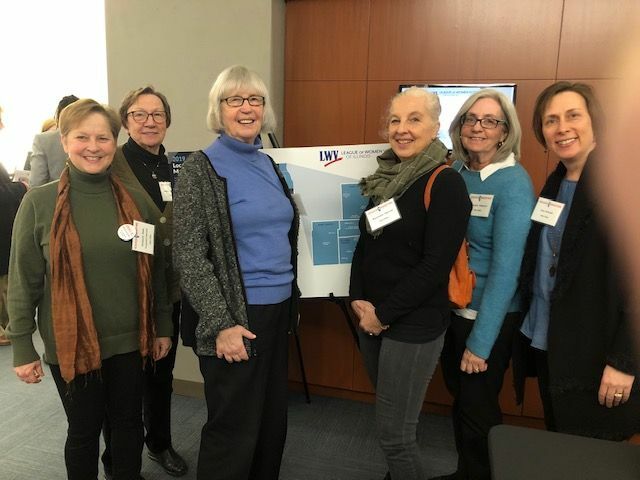 Our Annual Meeting gives us a chance to review the important workings of LWVGE. To that end, we offer the following documents for your careful consideration. Please make time to familiar yourself with the information here prior to our very special annual meeting/dinner on Thursday, May 2. And watch for invitations to come! Please visit our wonderful advertisers! If you patronize any of our local business supporters, let them know we appreciate their attention. They help make what we do possible.